Computer hackers plan to take the internet beyond the reach of censors by putting their own communication satellites into orbit. The scheme was outlined at the Chaos Communication Congress in Berlin. The project's organisers said the Hackerspace Global Grid will also involve developing a grid of ground stations to track and communicate with the satellites. Longer term they hope to help put an amateur astronaut on the moon. Hobbyists have already put a few small satellites into orbit - usually only for brief periods of time - but tracking the devices has proved difficult for low-budget projects. "The first goal is an uncensorable internet in space. Let's take the internet out of the control of terrestrial entities," Mr Farr said. He cited the proposedStop Online Piracy Act (Sopa)in the United States as an example of the kind of threat facing online freedom. If passed, the act would allow for some sites to be blocked on copyright grounds. Although space missions have been the preserve of national agencies and large companies, amateur enthusiasts have launched objects into the heavens. 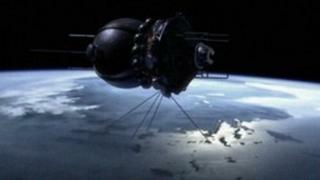 High-altitude balloons have also been used to place cameras and other equipment into what is termed "near space". The balloons can linger for extended amounts of time - but are not suitable for satellites. The amateur radio satellite Arissat-1 was deployed into low earth orbit last year via a spacewalk by two Russian cosmonauts from the International Space Station as part of an educational project. Students and academics have also launched other objects by piggybacking official rocket launches. However, these devices have often proved tricky to pinpoint precisely from the ground. According to Armin Bauer, a 26-year-old enthusiast from Stuttgart who is working on theHackerspace Global Grid, this is largely due to lack of funding. "Professionals can track satellites from ground stations, but usually they don't have to because, if you pay a large sum [to send the satellite up on a rocket], they put it in an exact place," Mr Bauer said. In the long run, a wider hacker aerospace project aims to put an amateur astronaut onto the moon within the next 23 years. "It is very ambitious so we said let's try something smaller first," Mr Bauer added. The Berlin conference was the latest meeting held by the Chaos Computer Club, a decades-old German hacker group that has proven influential not only for those interested in exploiting or improving computer security, but also for people who enjoy tinkering with hardware and software. When Mr Farr called for contributions to Hackerspace, Mr Bauer and others decided to concentrate on the communications infrastructure aspect of the scheme. He and his teammates are working on their part of the project together withConstellation, an existing German aerospace research initiativethat mostly consists of interlinked student projects. In the open-source spirit of Hackerspace, Mr Bauer and some friends came up with the idea of a distributed network of low-cost ground stations that can be bought or built by individuals. Used together in a global network, these stations would be able to pinpoint satellites at any given time, while also making it easier and more reliable for fast-moving satellites to send data back to earth. "It's kind of a reverse GPS," Mr Bauer said. "GPS uses satellites to calculate where we are, and this tells us where the satellites are. We would use GPS co-ordinates but also improve on them by using fixed sites in precisely-known locations." Mr Bauer said the team would have three prototype ground stations in place in the first half of 2012, and hoped to give away some working models at the next Chaos Communication Congress in a year's time. They would also sell the devices on a non-profit basis. "We're aiming for 100 euros (£84) per ground station. That is the amount people tell us they would be willing to spend," Mr Bauer added. Experts say the satellite project is feasible, but could be restricted by technical limitations. "Low earth orbit satellites such as have been launched by amateurs so far, do not stay in a single place but rather orbit, typically every 90 minutes," said Prof Alan Woodward from the computing department at the University of Surrey. "That's not to say they can't be used for communications but obviously only for the relatively brief periods that they are in your view. It's difficult to see how such satellites could be used as a viable communications grid other than in bursts, even if there were a significant number in your constellation." This problem could be avoided if the hackers managed to put their satellites into geostationary orbits above the equator. This would allow them to match the earth's movement and appear to be motionless when viewed from the ground. However, this would pose a different problem. "It means that they are so far from earth that there is an appreciable delay on any signal, which can interfere with certain Internet applications," Prof Woodward said. "There is also an interesting legal dimension in that outer space is not governed by the countries over which it floats. So, theoretically it could be a place for illegal communication to thrive. However, the corollary is that any country could take the law into their own hands and disable the satellites." Apart from the ground station scheme, other aspects of the Hackerspace project that are being worked on include the development of new electronics that can survive in space, and the launch vehicles that can get them there in the first place. According to Mr Farr, the "only motive" of the Hackerspace Global Grid is knowledge. He said many participants are frustrated that no person has been sent past low Earth orbit since the Apollo 17 mission in 1972. "This [hacker] community can put humanity back in space in a meaningful way," Farr said. "The goal is to get back to where we were in the 1970s. Hackers find it offensive that we've had the technology since before many of us were born and we haven't gone back." Asked whether some might see negative security implications in the idea of establishing a hacker presence in space, Farr said the only downside would be that "people might not be able to censor your internet". "Hackers are about open information," Farr added. "We believe communication is a human right."